The holy celebration comes closer. At the latest, when the radio plays the first Christmas songs, and the first shiny Christmas markets open, it's time to think of your own Christmas decoration. The suitable decoration will encourage to create a cheerful and festive atmosphere. Crib and decoration for the Christmas tree don't need to be old and kitschy. Find modern and trendy accessories according to your modern lifestyle in the interior design shop, together with some classic pieces. Are you missing decoration for your Christmas tree, are you looking for original crib figures or do you still need creative gifts for Christmas? Then the Connox interior design shop is the right place for you. There are only first-class products of famous designers available in the assortment. We made this selection personally for you. There is a lot of love for details in many Christmas design pieces, others are reduced to the essence. The crib corpus delicti is a piece of pure design for collectors. The traditional kitsch of Christmas is completely ignored by the Berlin artist Oliver Fabel, who designed the crib figures out of simple, wooden blocks with printed names and was awarded with the Form prize 2008. The the Three Wise Men from Alessi are less reduced but still modern. And those of you preferring kitsch will like the Kay Bojesen Denmark Santa. Also discover our decoration for the Christmas tree. We offer hand-decorated Christmas tree baubles made of mouth-blown glass by Alessi, they represent the figures of a traditional nativity scene. Complete your Christmas tree ornaments with the noble Christmas tree tops from Georg Jensen. Moreover there are numerous original products in the Christmas assortment, which are wonderfully suitable as presents. Make the ones you love smile with the Hoptimist reindeer Bumble Rudolf. The jumping reindeer is a stylish piece of decoration spreading joy and happiness. You can't find anything in this category? There is more - find votive candleholders, candleholders, table decoration, wrapping paper and boxes and gifts for Christmas in the according categories. Find advent calendars in our advent assortment. When to Start Decorating for Christmas? The 1st of Advent is usually the day we decorate our houses. It doesn't matter if the shelves of supermarkets are already filled with decoration and Christmas sweets in September. The holy commemoration Sunday of the death for Catholics is the last Sunday before the 1st of Advent, and religious people think of eternal life and memorize the ones they've lost. As soon as this date is over, the official time of decorating homes can start. The time until the windows and balconies of our neighbours shine comes quickly afterwards. Stars, Santa Clauses and colourful light chains fill the air with happiness. 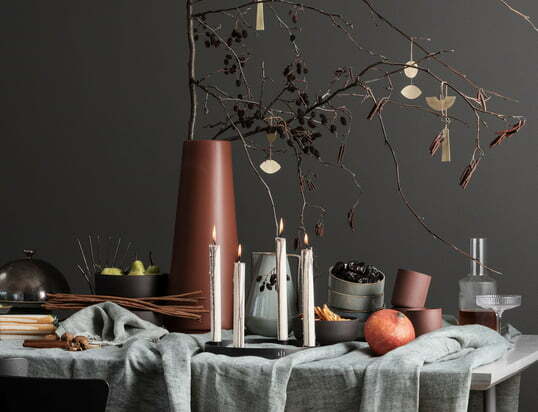 Of course, you can start with comfortable accessories like scented candles and votive candles long before that date. How Long can the Christmas Decoration Stay? Traditionally, the Christmas tree and the decoration remain unchanged until the 6th of January, which is the day of the Three Wise Men. Christmas ended officially on that day. Many cities organise a Christmas tree action on the following Saturday. There it is possible to let someone get your tree from your house for a little dotation. That's the reason for many people to bring the Christmas decoration back into the boxes on the Friday before. When did Christmas Decoration come into Being? And why? The tradition of trimming the Christmas tree started a long time ago. People decorated their homes with winter-green and burning lights for Christmas, in order to keep wild animals away. The army of ghosts was believed to be especially around in the twelve nights between Christmas and the 6th of January. The green branches were thereby lovingly decorated with gilded apples, nuts and ribbons. In the second half of the 16th century, people started to install decorated trees in their homes at Christmas. The noble houses hung fruits, coloured paper and jewellery, sweetmeat, nuts and gingerbread in their trees. That's the reason why the Christmas tree was called sugar tree at that time. The children were allowed to shake the things off of the tree after Christmas. Burning candles were still placed to keep ghosts away in that time. The first documentation about fir trees as Christmas trees comes from the Alsace of the early 17th century. The tradition spread quickly and today there are baubles hanging on the trees, instead of apples. And instead of nuts and gingerbread there are stars and other pieces of design – maybe some of the Connox assortment. Be inspired by our selection and find some gifts for Christmas as well.